The M80-SH Dynamic Microphone from Telefunken is built to deliver condenser-like audio reproduction for stage and studio applications. It is designed for snare drum and vocal scenarios where a short microphone with a right angle XLR connection is required. The M80-SH features a high SPL capability and a tight cardioid polar pattern with a subtle rise in the treble. 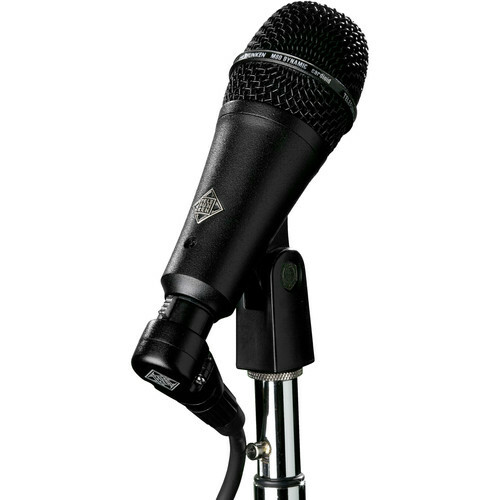 The microphone is constructed with a black metal grill and includes a leather microphone bag, a microphone clip, and a 5 meter right-angle XLR cable. Box Dimensions (LxWxH) 10.7 x 7.2 x 4.3"